Dedicated to St Peter, imposing York Minster stands testament to the monks who converted the locals to Christianity in the 3rd and 4th centuries. So important was York Minster in the Christian faith's early years - and so great it's reputation - that its bishops were invited to participate in the council at Arles in 314 AD. After this, little was heard until 627 AD when the oldest documented (wooden) church was built here for the baptism of King Edwin of Northumbria. 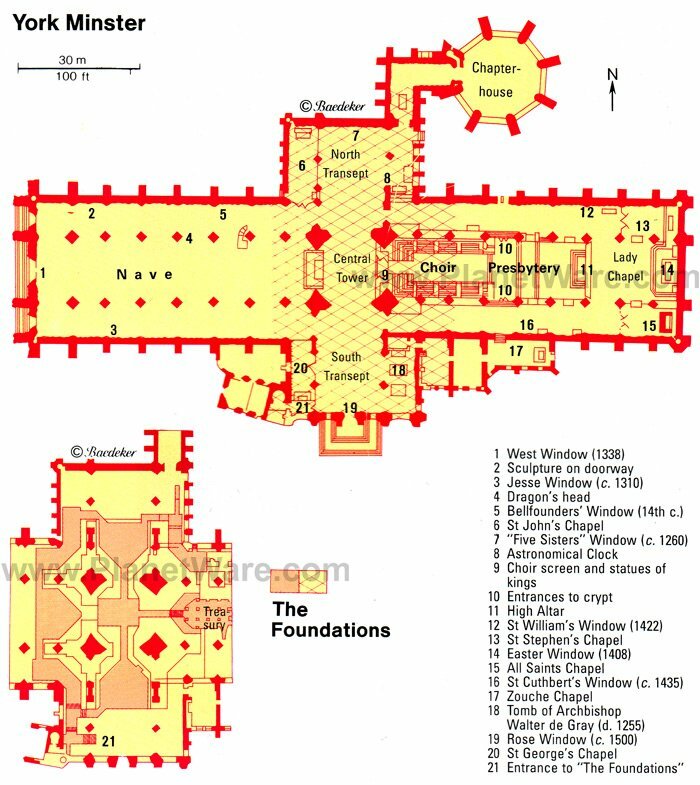 Succeeding Saxon and Norman constructions were destroyed, and the cathedral was rebuilt in its present Gothic style in the 13th century. First impressions are everything, and even the humble aisles you see upon entering York Minster impress with their interesting decorative features. In the north (left-hand) aisle, the chapel door is notable for its 14th century sculptures. A little further along is the Pilgrimage Window (dating from about 1312) resting above a stunning dragon's head, depicting Peter surrounded by pilgrims and many unusual details such as the funeral of a monkey. Next to this is the radiant 14th century Bellfounders' Window with its relevant motifs. The Jesse Window (about 1310) is also remarkable and depicts scenes including David and Solomon. The triple-naved Choir Aisle was built in the English early Gothic style between 1220 and 1280. The back wall of the North Transept features five narrow lancet windows (about 1260) known as the "Five Sisters Window" (a term coined by Charles Dickens). The Crossing with its 15th century vaulted tower contains the Rood-screen, a masterpiece of late Gothic sculpture containing statues of 15 English kings, starting with William I on the left and finishing with Henry VI. The cathedral's Norman Choir was rebuilt in the late 14th century, and was later damaged by a fire in 1829 that destroyed the roof and woodwork (including the choir stalls). Copies of the originals have replaced all. St William's Window (1422) in the South Gallery depicts scenes from the life of St William, whose shrine in the sacristy was worshipped in the Middle Ages. St Cuthbert's Window (about 1435) in the North Gallery portrays events in the life of this saint who was consecrated as Archbishop in 685 AD in the former Saxon minster. Behind the Choir is the Lady Chapel with its magnificent East Window (about 1408), the world's largest medieval stained glass window. In the South Transept is the marvelous Rose Window (about 1500) commemorating the ending of the War of the Roses, fought between the Houses of Lancaster and York for the throne. The Minster's 12th century Norman Crypt is entered from the Presbytery and is where you'll find the remains of the 11th century Apse of the earlier cathedral, as well as parts of the 14th century Eastern Crypt. The Crypt's valuable contents include the York Virgin (12th century Madonna), the Doomstone (purgatory relief, late 12th century), the 15th century font used for the baptism of King Edwin by Bishop Paulinus in 627 AD, and the shrine of St William of York (Archbishop, d 1154), which was brought here in 1972. The Vestibule of the Chapterhouse is reached from the North Transept. On entering this part of the cathedral, visitors will immediately notice a window (about 1300) depicting kings and queens, and the richly decorated capitals. The flaying of St Bartholomew can be seen on a capital to the right of the 13th century door with interlaced decoration leading to the octagonal Chapterhouse (1260-1285). The painted wooden vaulted roof is self-supporting and was renewed first in 1798 and again in 1976. The fine stall-canopies are impressive, as are the tracery windows, the glass of which dates from the 13th century. Among the many interesting buildings to be found in York Minster Close are the 15th century half-timbered St William's College with its medieval chambers, the 17th century Treasurer's House containing numerous antiques, and the Minster Library housed in a 12th century chapel and home to more than 120,000 books and manuscripts. On the south side of the Minster is the church of St Michael-le-Belfrey (rebuilt 1536), which has interesting stained glass windows. A 4th century Roman column standing behind it commemorates the day Constantine was proclaimed Emperor of Rome in York in 306 AD. Located in the Undercroft and Treasury underneath York Minster, this fascinating exhibit consists of numerous interactive galleries portraying the building's colorful history from its Roman roots to today. Displays include more than 2,000 years of remarkable artifacts found nearby that provide an insight into the cathedral's important role over the centuries. This fascinating unique elliptical structure within the cathedral showcases some of the world's most important medieval art. Focusing on York Minster's Great East Window, the Orb was set up to display sections of the window as they're restored, allowing visitors an up-close look at the panels. This wonderful opportunity to view this historic artwork will continue throughout the window's restoration, scheduled for completion in 2016. York Minster's spectacular medieval Central Tower - the highest point in the city - involves a climb of 230 ft up the 275 steps, so isn't for the faint of heart. Along the way, you'll get a close up view of some of the cathedral's most interesting decorative features, including its pinnacles and gargoyles. Once outside, all that hard work will be rewarded with superb views of York's historic city center. York Minster offers a number of excellent guided tours (included with admission) highlighting the building's main features and history, as well as some of its lesser-known secrets (Mon-Sat, hourly, 10am-3pm). If travelling with youngsters, ask for one of the cathedral's "Little Explorer Backpacks" when purchasing your tickets. These fun (and free) backpacks include a host of neat tools for youngsters to use as they explore, including a flashlight, binoculars, a compass and map, magnifying glass, and pencil crayons and paper to record their findings. Closures: York Minster is very much a working building, and while sightseers are permitted, there are occasions when closures are necessary. To ensure such eventualities don't interfere with your visit, check the What's On page before arrival. Events: Lectures, workshops and courses are often available to the general public and visitors, along with musical performances and other special events. To learn more, visit the cathedral's What's On page. Food: While York Minster has no food outlets of its own, it's located in a vibrant pedestrian area with countless excellent dining options, from fast fresh food to fine dining. Shopping: Three on site shops serve visitors: the Minster Gift Shop (within the Minster) and York Minster Gifts and No.10 (situated in Minster Gates). Most items available here are also available from their online shop. Services: Weekdays - 7:30am, Matins; 7:45am, Holy Communion; 12pm, Holy Communion; 5:15pm, Evensong; Sundays - 8am, Holy Communion; 10am, Sung Eucharist; 11:30am, Matins; 4pm, Evensong. By Train: York has fast direct rail links from London, Edinburgh and Manchester (approximately two hours travel time) and is just a 10-minute walk from York Rail Station. For details, including occasional 2-for-1 ticket offers, visit www.nationalrail.co.uk. By Road: York is centrally located and easily accessible from all parts of the country by an excellent road network. Parking: The City of York operates a network of perimeter parking lots with buses connecting to the heart of the city. York Minster sits amidst some of the very best sightseeing attractions in England and is a place you'll want to spend more than a day at if possible. One of the best ways to experience this remarkable city is to walk along its circuit of medieval city walls, nearly 3 mi long and offering marvelous views. Also, spend time walking along the River Ouse or, better still, take a river cruise. Other tourist attractions within an easy walk are York Castle and its excellent museum, the National Railway Museum with its impressive collection of steam engines, and the city's numerous historic guildhalls. Then, of course, there are the many ancient winding streets, in particular the famous Shambles, a narrow 14th century thoroughfare with lovely overhanging timber-framed buildings. York was also once a Viking stronghold, and the Jorvik Viking Centre is a great place to learn more about this fascinating period in the city's history.